Researchers identify protein responsible for DNA repair at a stem cell level. A protein that helps embryonic stem cells retain their identity also promotes DNA repair, according to a study in The Journal of Cell Biology. The findings raise the possibility that the protein, Sall4, performs a similar role in cancer cells, helping them fix DNA damage to survive chemotherapy. Fixing broken DNA is particularly important for embryonic stem cells because they will pass on any mutations to their differentiated descendants. Mouse embryonic stem cells are adept at making repairs, they carry far fewer mutations than do differentiated cells, but how they achieve this isn’t clear. Previous studies have revealed that double-strand breaks trigger epigenetic changes to embryonic stem cell chromatin. A team of researchers from the University of California in the current study tested whether the protein Sall4, which suppresses differentiation of embryonic stem cells and interacts with chromatin-remodeling protein complexes, has a role in DNA repair. The researchers found that embryonic stem cells lacking Sall4 were poor at mending double-strand breaks, a hazardous form of DNA damage in which both strands of the double helix are severed. They also observed that, after inducing DNA damage in mouse embryonic stem cells, Sall4 associated with proteins known to be involved in DNA repair. 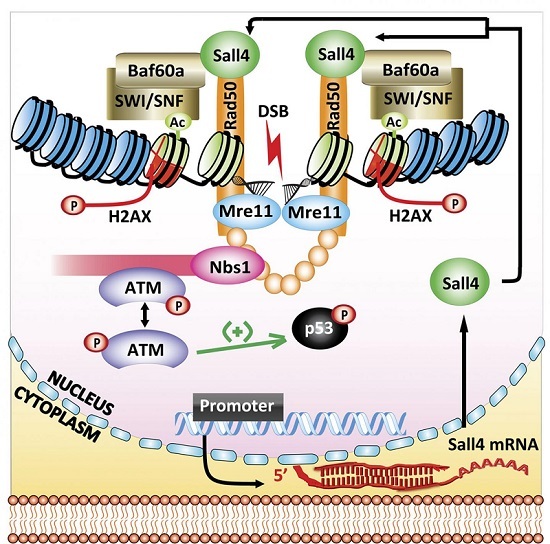 Overall, their findings support a model for how Sall4 is recruited to the sites of these breaks and activates ATM, a kinase that signals DNA damage and instigates repair. Because tumour cells often overexpress Sall4, the protein might similarly help them repair DNA damage. Sall4 could therefore be considered a target for drug development in cancer biology. The team determined that Baf60a recruits Sall4 to double strand breaks. Baf60a is a component of the SWItch/Sucrose NonFermentable (SWI/SNF) complex that reorganizes chromatin at sites of DNA damage. The study raises the possibility that Sall4 performs the same role in cancer cells as it does in embryonic stem cells. The team summise that tumour cells often overexpress the protein, suggesting that it might help them fix DNA damage and survive chemotherapy. This is an illustrated model for the role of Sall4 in activating ATM to repair DNA damage in embryonic stem cells. Credit: Xiong et al., 2015.